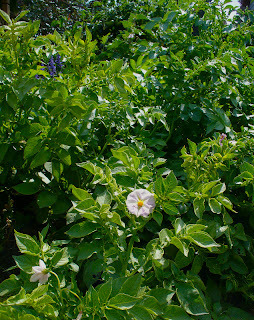 All summer long I have been watching my two potato plants grown with mounting trepidation. The foliage has gotten bigger, bigger and bigger (even bigger than my summer squash plant and THAT’s saying something), threw off lovely little lavender blossoms by the dozens and gave absolutely NO CLUE to what was happening in the ground down below. I’m a visual sort of person when it comes to growing vegetables. I like to see buds, the starts of mini cukes, tomatoes, eggplant, beans, whatever. 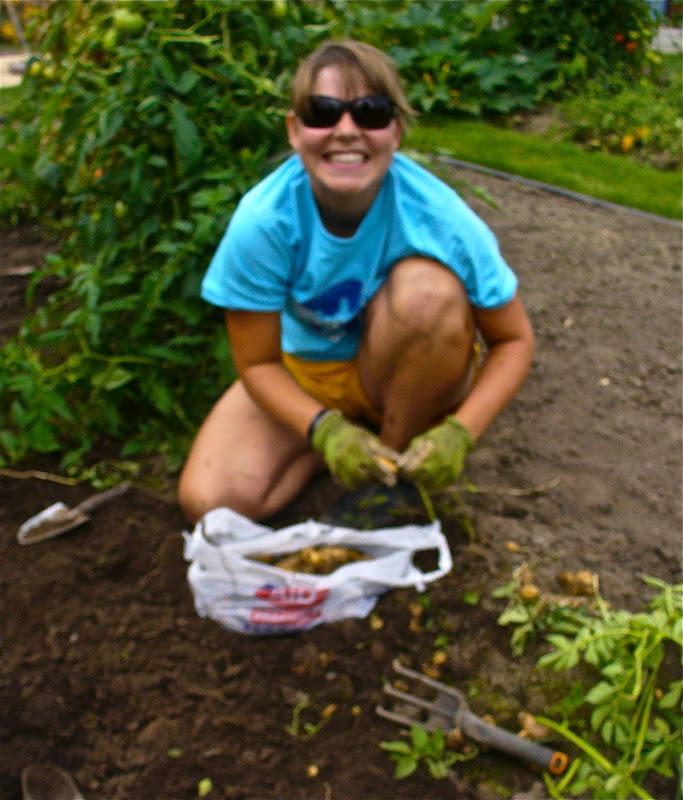 So the potato gig was pretty much unbearable for me – although the plants themselves really hit it out of the park in terms of visual attractiveness. . . if you can call two potato plants approaching the size of year-old grizzly cubs attractive. I was pestered with all the doubts I voiced when they went into ground back in May. What if they got scab or blight or whatever they call the crud behind mass potato fatalities? How would I know if they were being ravaged by insatiable six-legged subterranean terrorists? What if their barren shoots were down there laughing their heads off at my audacity to attempt potatoes? There were no answers. Just one more handful of lovely little lavender blossoms lifted away by a late summer breeze. I took Farmanatrix Kate at her word. 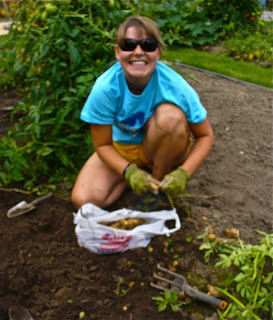 She has experience as a community gardener. And with potatoes. “I love potatoes. Can I be there when you harvest?” she asked. Damn straight you can, Farmanatrix Kate. You’re leading the charge, honey! And so we found ourselves crouching around the plants that humid Saturday afternoon, carefully stabbing and shifting the ground around each plant. And, then, lo and behold, there were potatoes. 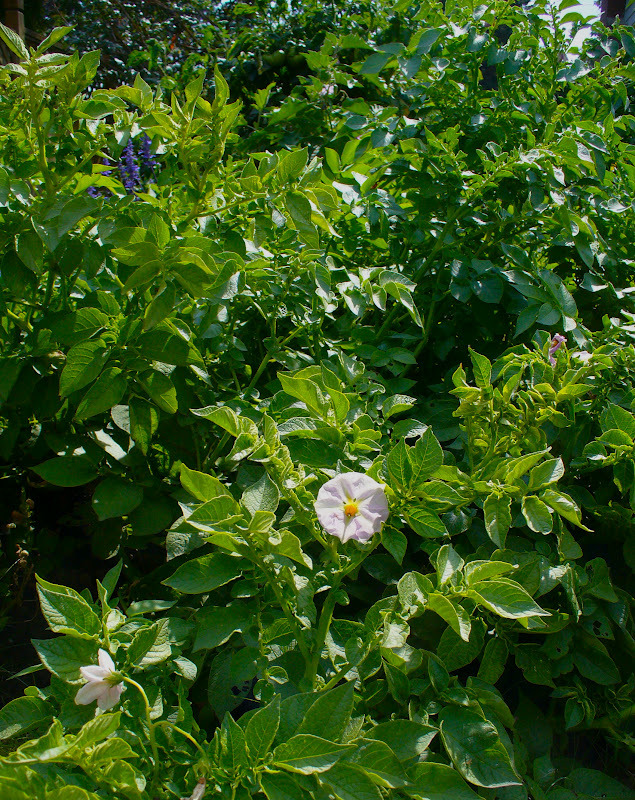 Dozens upon dozens of adorable miniature fingerlings – two, three, four strung together on sturdy little potato vines. We were surrounded by potatoes, so many that in the end we split the booty because my date and I could not humanly consume that many spuds, delicious as they have proven to be. My spuds had survived, thrived and arrived. And on that note, I share a dandy recipe for potatoes and green beans -- another WPFF crop that has proven ever-so-bountiful. Note: I am really digging finding recipes where I can use two or three crop items in one fell swoop. Last night was Rock Star -- summer squash burgers topped with summer squash relish and the salad below. Now only 45 squash, 25 cukes, 9 Japanese eggplant and 4 dozen beans to go. Cook the bacon in a skillet over medium heat till crisp and brown, about 8 minutes. (Resist eating about half of it like I did.) Transfer to a paper towel to drain and cool, then crumble. Bring a saucepan of lightly salted water to a boil over high heat. Add the the potatoes and reduce heat to medium. Cook till the potatoes are tender, about 10 minutes. 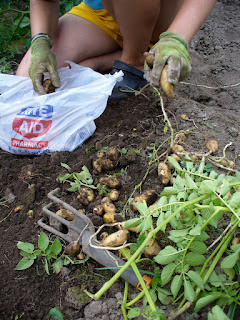 Using slotted spoon or skimmer, removed the potatoes but retain the water. Rinse potatoes under cold water and set aside to cool slightly. Cut into 1/4-inch rounds. Add green beans to the water and cook till barely tender, about 3 minutes. Drain and rinse under cold water. Cut beans into 1-inch lengths. Whisk the vinegar, mustards and garlic in salad bowl. Gradually whisk in the oil, add the herbs. Add the potatoes, green beans and red pepper strips and mixed. Mix in what remains of the bacon, sprinkle with the basil and season with salt and pepper. Serve warm. Note: We did not serve warm since a couple friends of the Number 1 Son dropped by just as I was whisking up the dressing. They left about 20 minutes later, ladened with summer squash, cukes, cherry tomatoes, taters and Japanese eggplant with threats of more to be left on their doorstep. The salad was delicious nonetheless.